Raymond Smeriglio's life gets turned upside down in this week's wild Sweat Diaries. 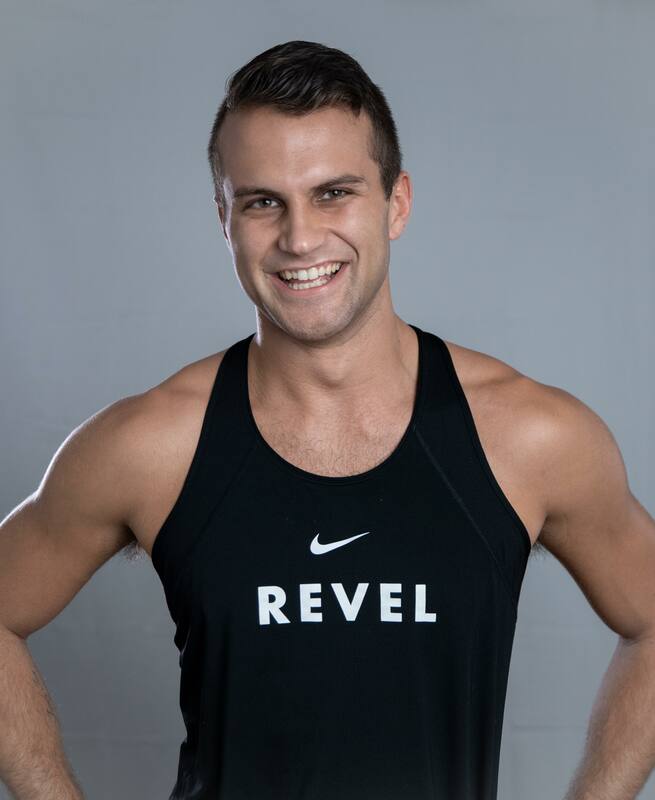 By Mary Clare Fischer·	 3/21/2019, 9:19 a.m.
What I do: I’m a major gift officer at Villanova University’s Charles Widger School of Law, an adjunct faculty member at Temple University’s Klein College of Media and Communication, and the marketing manager and an instructor at Revel Ride. What role healthy living plays in my life: Healthy living plays an integral role in helping me stay centered. Monday through Friday, I immerse myself in work, socializing, nonprofit activities — but the hour a day I reserve to take care of myself, physically and mentally, helps me check out of everything. 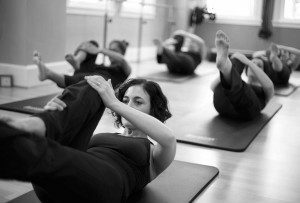 Health memberships (and what they cost): I pay $70 a month at City Fitness; teaching at Revel helps keep my indoor cycling costs down. 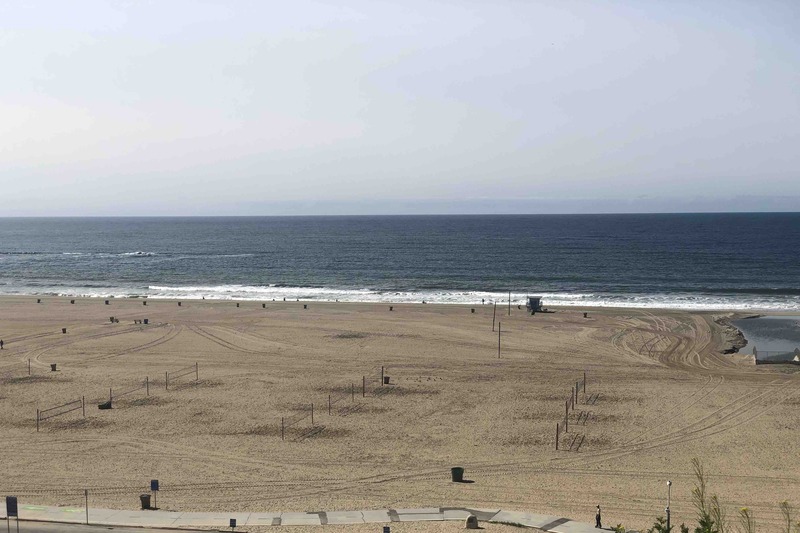 11 a.m. PST – After some time to digest, I throw on a pair of leggings and start a run down Wilshire Boulevard on a quest to snag a photo of the beach in Santa Monica. About halfway there, I run through some sort of film shoot — and right past Jonah Hill of Superbad and 21 Jump Street fame. 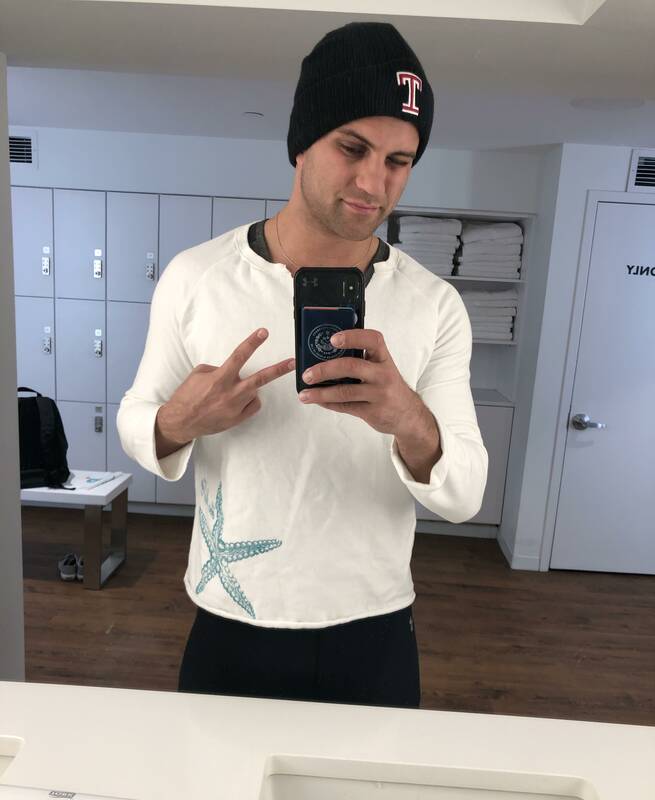 Noon PST – Six miles, one celebrity sighting, and a decent beach picture later, I’m back at Sebastian’s apartment to take a quick shower, pack the last of my things, and head to the airport. 12:45 p.m. PST – LA traffic isn’t terrible (true shocker), so I get to the airport in good time. I am now STARVING and looking for food, but options are limited in the terminal. I commit to an Asian spot, and lunch is served: teriyaki chicken over some brown rice with a giant Fiji water. 2:05 p.m. PST – Time for takeoff. One of my good friends, a flight attendant and drag queen, is working my flight back, and it makes the six hours of flight time fly right by. 11:30 p.m. EST – The bag situation took longer than expected, but I am finally HOME. I’m exhausted and a little hungry, and I grab a granola bar from the cabinet. Midnight EST – Lights out, alarm set. 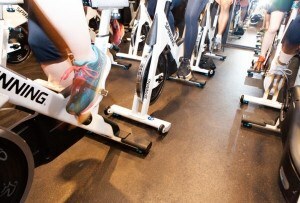 Tomorrow, I’m getting right back on the grind with a 6:30 a.m. class at Revel Ride. As I close my eyes, I realize my playlist isn’t built for the class yet because the WiFi on the plane wasn’t working. Have to wake up half an hour earlier tomorrow to get that done. 5 a.m. — The soothing sound of a nuclear power plant’s emergency alarm comes blaring from my phone. Back to reality today, and let me tell you, it is cold. I brew a cup of coffee and take the next 25 minutes to make a fire playlist. 5:45 a.m. — Out the door. Despite the cold, I love my morning walks to Revel. My AirPods are always in, blasting my playlist to make sure everything’s ready to go. 6:15 a.m. — JJ Francis’ 5:30 a.m. class is just finishing, and as tradition has it, I fling open the door of the studio and see all the sweaty, smiling faces of those who just rode for 45 minutes. I throw on a mic pack and get ready to ride. 7:45 a.m. — I snag a shower at the studio then give Miles Table, the bistro next door, a buzz and ask for my usual, the early bird special: two eggs over easy, multigrain toast, and a side of bacon. The early bird special if you will (it’s literally called that). It is my favorite part of Tuesday, especially when I have a long day ahead, which I do. 8:30 a.m. — I arrive at Capital One Café, set up my laptop, and start to catch up on work emails and draft some gift agreements for potential donor solicitations I have coming up. 11:45 a.m. — I’m having lunch at the Capital Grille with Liz Dow, the CEO of the nonprofit Leadership Philadelphia, which provides leadership training and civic education. In August, I joined Leadership Philadelphia’s Keepers class (a young leaders program) and have been lucky enough to start to learn from Liz. 1:30 p.m. — I pop next door to see my sister, Jessica, who’s an attorney at a local law firm. For the rest of the day I’m in and out of law firms and meetings, touching base with our alumni and current donors, moving some conversations forward in regards to their philanthropy at Villanova. 4 p.m. – I dial into a planning call with the Mayor’s Office of Public Engagement. Two years ago, I was nominated to Mayor Jim Kenney’s Millennial Advisory Committee, and we’re planning an event series to engage millennials in Philly with current issues facing the city. 5 p.m. — I walk into ChatterBlast, a social media marketing company owned by two of my good friends. 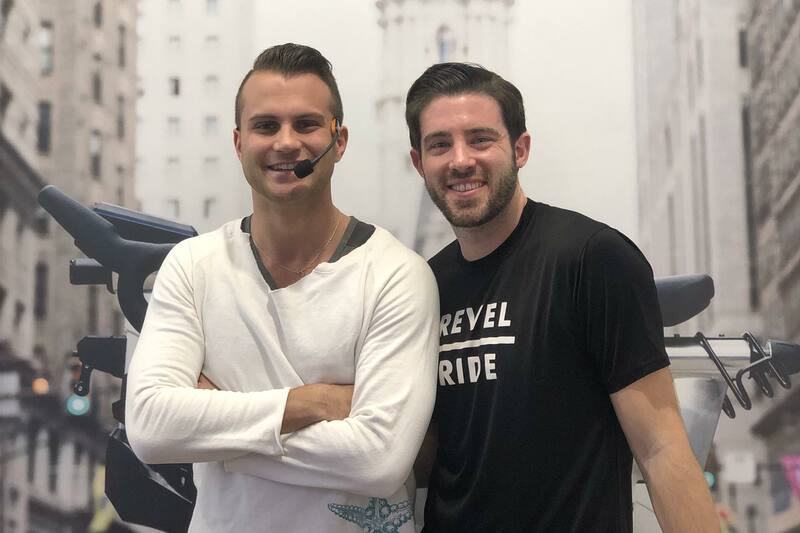 We’re working on a project to take Revel Ride’s online brand to the next level and decided to come together to brainstorm. Their office has peanut butter M&M’s en masse on the conference table. I have at least 20 during the meeting. 6 p.m. — I head to Acme on 10th and South streets. Texting back and forth with my roommate, Kami, on dinner plans, and we settle on stuffed peppers and Brussels sprouts. Oh, and red wine…for the antioxidants? 7 p.m. — Dinner is served, and it’s Temptation Island reruns and my latest obsession, Workin’ Moms, on Netflix. This, my friends, is my version of heaven. Daily total: $55, including groceries for the meals I’m eating in the house the rest of the week. Liz was gracious enough to pick up lunch. 5:30 a.m. — Alarm blares. I throw on workout attire and head to the gym. Today, chest and triceps work, an ab circuit, and a treadmill run are on the docket. Just me, my AirPods, and my Nikes. 7 a.m. — Hop in the shower, throw on my work clothes for the day, and we’re off to the races. I head to a monthly leadership meeting at Little Spoon Café at 15th and South streets for Back on My Feet Philadelphia’s Young Leaders Association, which I’m lucky enough to be the chair of this year. I get the yogurt parfait and a coffee. 8:45 a.m. — Meeting concludes, scarf comes back on, and I’m out the door. 9:15 a.m. — Wow, it’s cold. I head to Saxbys HQ and have a cup of coffee with Nick Bayer, the CEO. We touch base pretty regularly and talk partnership opportunities. 10:30 a.m. — Nick and I wrap up, and I head to City Fitness’ Logan Square location to use the coworking space there. Noon — Lunch is a protein smoothie from Bimini Juice Bar & Salad Bar. The rest of the day looks like yesterday, in and out of firms and offices talking with supporters. 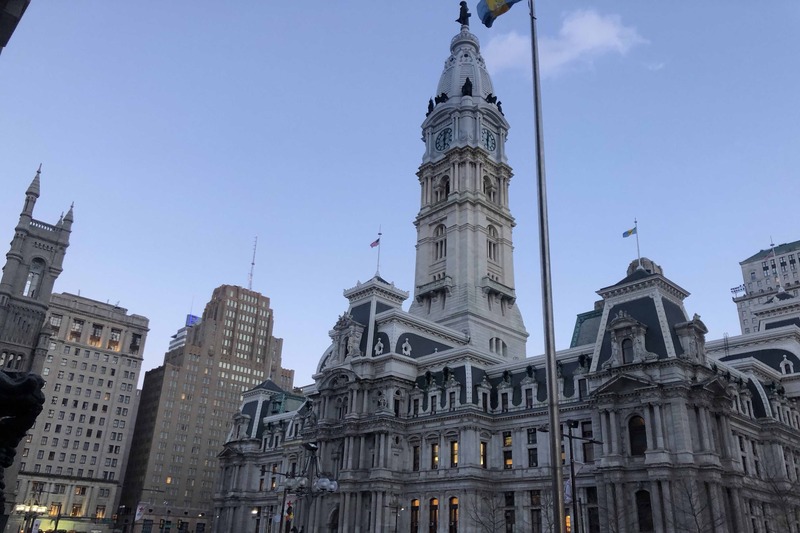 3 p.m. — I pop into an office building on Market Street to grab coffee with Michael Delbene, the new CEO of Wawa Welcome America to learn more about his role and talk development as Mike’s background, similar to mine, is in fundraising. 6 p.m. — After finishing up some work, I head to the Municipal Services Building for a meeting with the Mayor’s Millennial Advisory Committee. Pizza is served in all its cheesy goodness. As the son of a former pizza shop owner, my heart is full. 8 p.m. — The meeting concludes. The committee’s executive team has to catch up on a few things, and we do so over a drink at Le Meridien. 10 p.m. — A Lyft home, and the day is done. 5:30 a.m. — Back at it. Bags packed, workout attire on, out the door. 6 a.m. — Back and biceps work, pushups, an ab circuit, and the Stairmaster. 8 a.m. — I’m in a conference room at MSC Retail on Rittenhouse Square for an advisory board meeting for Back on My Feet Philadelphia. Breakfast is provided, so I chow down on a coffee and half of a Federal Donut. About 15 minutes into the meeting, I get up and eat the other half of the doughnut. 9:30 a.m. — It’s another day full of meetings. This time, I’m posted up at Parliament Espresso & Coffee Bar next to City Hall. Noon — Lunch with a donor at DanDan Sichuan and Taiwanese Cuisine and then back to Parliament for more meetings and to continue working. 6:30 p.m. — After a quick shower, I join three friends who’d been in the Revel class for a drink and a bite. We take a walk to Pub & Kitchen; I order a beer, the grilled romaine, and buffalo wings. 9 p.m. – I walk in the door and review the day with the roommate before lights out at 9:30 p.m.
OK, so this is crazy. But it happened. 7 a.m. — My alarm goes off. I let myself sleep in on Fridays and usually work out at the end of the day. 8 a.m. — I head to my car to drive out to Villanova today; I have a full day of meetings planned. Except for one thing: My car isn’t where I parked it. 8 a.m. to 9 a.m. – I scour the area looking for my car. Nothing, so I call all the usual suspects. PPA doesn’t have it. Lew Blum, George Smith — none of the towing companies have it. Not a trace. At this point, I have to go to the local police precinct. 9 a.m. — I call my boss at Villanova and give him an update. He’s completely understanding and supportive, and I get the OK to handle my missing vehicle and get my work done when I figure this out. 9:30 a.m. — I arrive at the police station at 9th and South streets. They have no record of my car being towed either. They’re super helpful and apologetic, but since they have no record, I’m SOL. I have to call 911, get an officer out to my house, and survey the area in order to file a stolen vehicle report. For almost an hour, I ride along with a nice police officer, up and down every street within 10 blocks of my home. Nothing. So we fill out the report and deem the car stolen. 1 p.m. — Down one liquid asset, I cut my losses and head to Miles Table to work for the rest of the afternoon. 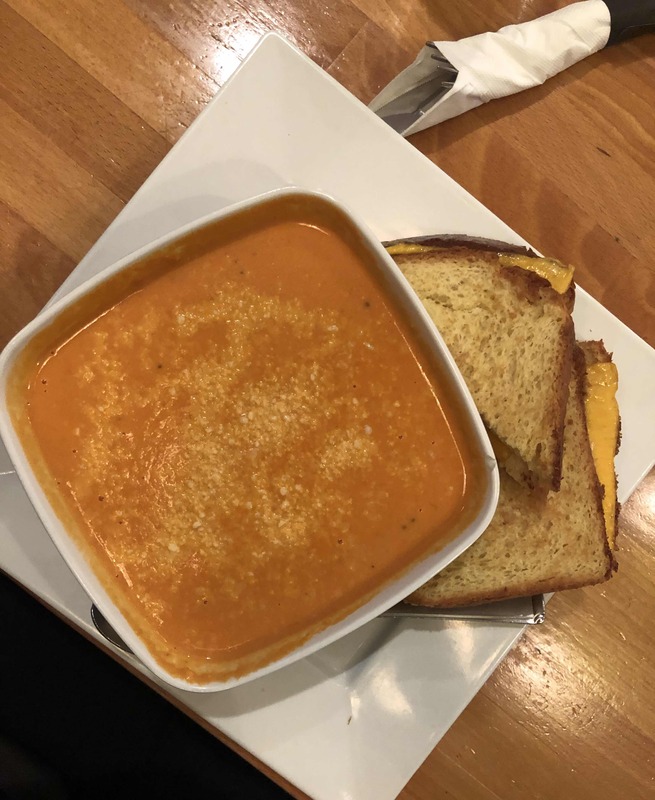 I have grilled cheese and tomato soup (comfort food — remember, I don’t know where my car is) and try to take my mind off things. 6:30 p.m. — After a shower and an outfit change, I stop back at Revel for the Friday happy hour we do with our riders. 7:30 p.m. — A glass of champagne later and tons of great conversation with riders, I head to dinner with two instructors, Sheila and JJ, and JJ’s fiancé, Kevin. I order the pork chop from Russet and cheers to everyone around the table. 10 p.m. — I come home and get into bed. My favorite class of the week is the next day, the 9 a.m. Saturday at Revel Ride, and my spirits are up. Good night. Note: The car was eventually found, very far away, with no sign of why it was moved.